Azure Functions is an event driven, compute-on-demand experience that extends the existing Azure application platform with capabilities to implement the code triggered by events occurring in Azure or third-party service as well as on-premises systems. 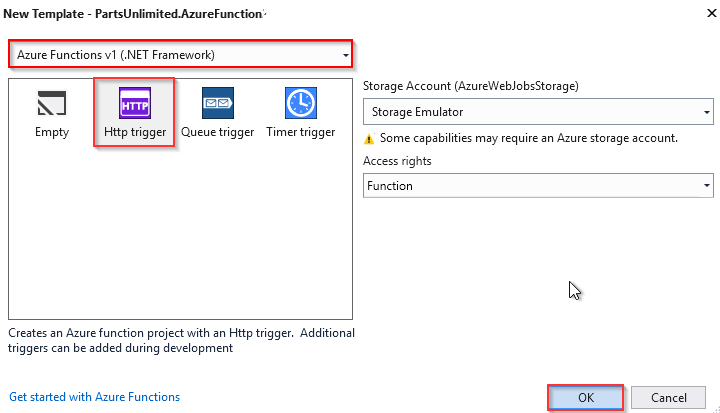 Azure Functions allows developers to take action by connecting to data sources or messaging solutions thus making it easy to process and react to events. Developers can leverage Azure Functions to build HTTP-based API endpoints accessible by a wide range of applications, mobile and IoT devices. What is covered in this lab? Visual Studio 2017: You can click the Hands-on Lab button below to launch a pre-configured virtual machine on our Hands-on Lab site. Use the Resources tab in the integrated instruction to find the credentials to login to the machine. Stay on this site and follow instructions with your own machine. Visit the Hands-on Lab site for integrated instruction. If you are a Visual Studio Active Subscriber, you are entitled for a $50-$150 credit per month. You can refer to this link to find out more including how to activate and start using your monthly Azure credit. If you are not a Visual Studio Subscriber, you can sign up for the FREE Visual Studio Dev Essentialsprogram to create Azure free account (includes 1 year of free services, $200 for 1st month). Visual Studio 2017 version 15.4 or later with .Net Core SDK, Git and Azure Development Tools for Visual Studio are installed. In this lab, you will be using a fictional eCommerce website - PartsUnlimited. The PartsUnlimited team wants to roll out a new discount for its employees and customers and wants to build Azure Functions that will retrieve the right discount depending on whether the logged in user is an employee or a customer. Let us create the required resources the Azure Portal. 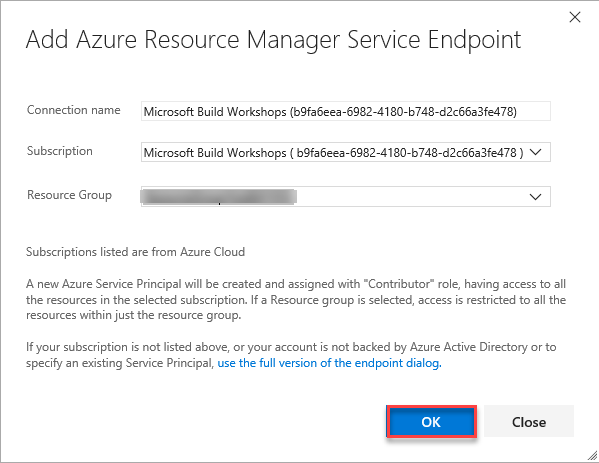 Click Deploy To Azure to provision required azure resources for this lab. Navigate to the Resource Group which you have created to view the resources. You should see 3 resources as shown below. Use the VSTS Demo Generator to provision the project on your VSTS account. VSTS Demo Generator helps you create team projects on your VSTS account with sample content that include source code, work items,iterations, service endpoints, build and release definitions based on the template you choose during the configuration. Accept the request for permissions by clicking on the Accept button. Select the previously created Team Services account from the drop down, provide the project name as PartsUnlimited and click Create Project. Once the project is created, click on the generated URL to be directed to the project portal in a new tab. 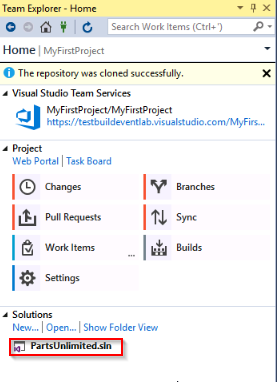 Navigate to the Code hub within the project portal, select Clone and then select Clone in Visual Studio. Note that VSTS supports a wide variety of IDEs including Eclipse, IntelliJ, XCode, Android Developer Studio, Visual Studio Code, etc. Once it is cloned, you should see PartsUnlimited.sln under Solutions in the Team Explorer. 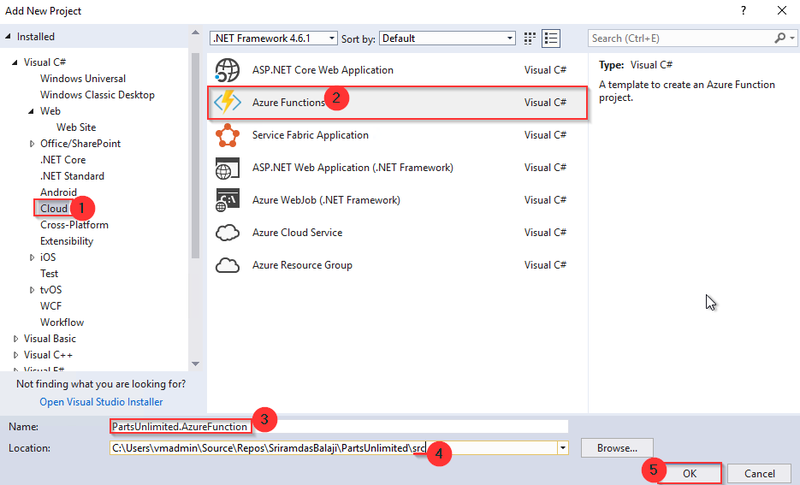 In this exercise, you will create an Azure Functions App from the Azure portal and then add code by creating an Azure Functions project in Visual Studio. The Azure Functions created in this exercise will act as a switching proxy or mechanism to return different (discount) information based on the user logged in to the application. Although you have used a simple condition here, this could also use more complex rules which could potentially be hidden behind another web api call. Go back to the Azure Portal. 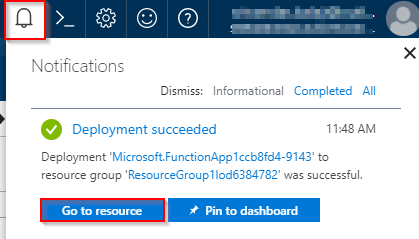 Select the +Create a resource button found on the upper left-hand corner of the Azure portal, then select Compute > Function App. Use the function app settings as specified in below image. 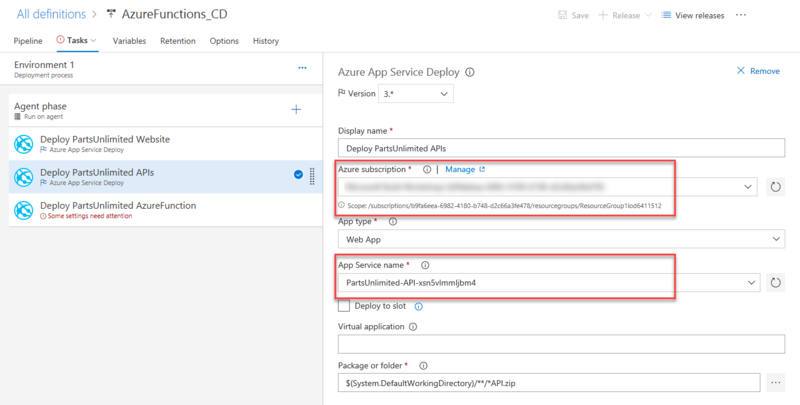 Select Create to provision and deploy the function app. Select the Notification icon in the upper-right corner of the portal and watch for the Deployment succeeded message. Select Go to resource to view your new function app. Expand your new function app, then click the + button next to Functions. In the Get started quickly page, select WebHook + API, Choose C# as language for your function, and click Create this function. In this lab, you are using C# as script language for your function, but you can create a function in any supported language. Select HttpTriggerCSharp1 in Functions and click </>Get Function Url. Copy the Azure Function URL and save to notepad. You will need this URL later on. Next you will add code to the Functions App. While there are many ways of doing it, you will use Visual Studio in this lab. 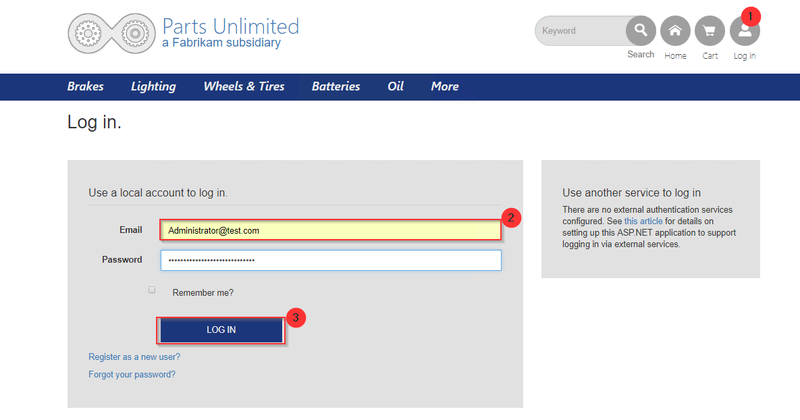 You will write code to redirect to the right APIs based on the user login, to return different (discount) information. 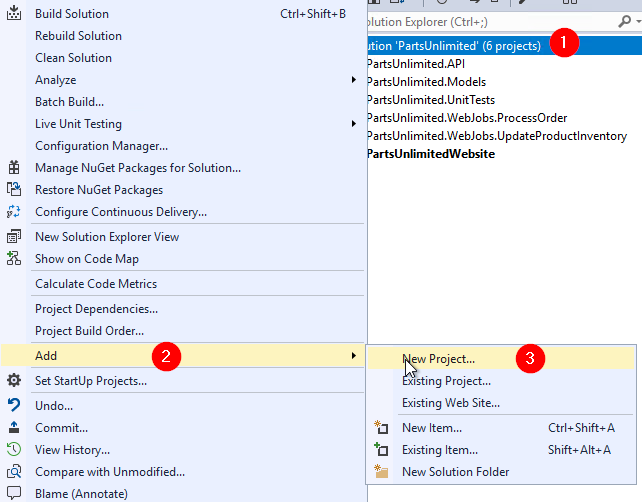 Return to Visual Studio, double click on the PartsUnlimited.sln solution to open it. Right click on the solution and select Add and select New Project. Select Cloud under Visual C# category, select Azure Functions as the type of this project. Enter PartsUnlimited.AzureFunction for the name and append \src at the end of the location, then click OK. Expand the PartsUnlimited.AzureFunction project, open Function 1.cs and replace the existing code with the following code. 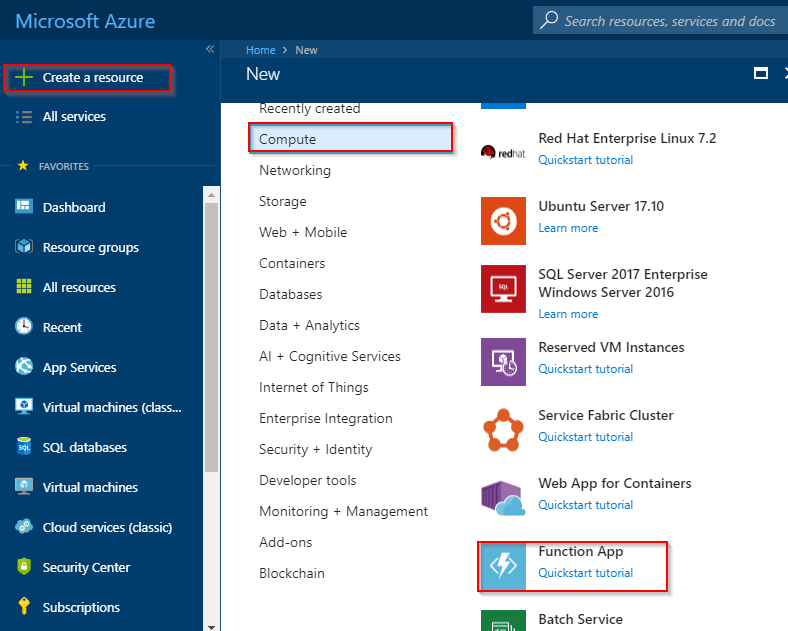 Navigate to the resource group where you have created resources in the Azure Portal. Click PartsUnlimited-API-XXXXXXX.azurewebsites.net and click the Copy icon under the URL section to copy the whole URL. Copy and replace YourAPIAppServiceUrl in url variable with API app service name. In StoreController.cs, replace the url variable in line 46 with the Function url copied in Step 7. Click Changes in Team Explorer, provide a comment and select Commit all and Push to push the changes to the remote repository. Next, in this exercise, you will look at the build definition to get an insight of how the code is built as part of the the CI pipeline. 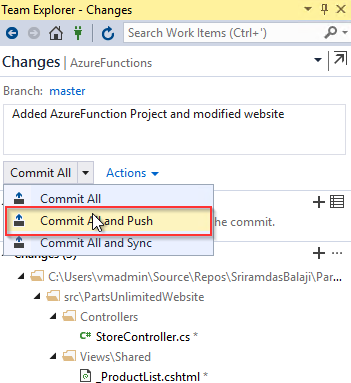 Click the Build and Release hub in VSTS portal, select the build definition AzureFunctions_CI and click the ellipsis ... button and click Edit option in the menu to view the tasks within the build definition. Select Save & queue to save and start your first build. A new build is started. You will see a link to the new build on the top of the page. Click the link to watch the live logs of the build as it happens. Wait for the build to complete and succeed before proceeding to the next section. Once the build succeeds, click the Release option from the Build & Release hub. In the Release page, select the definition AzureFunctions_CD and click Edit. Select the artifact trigger and make sure the Continuous deployment trigger is enabled. To deploy PartsUnlimited Website, click Tasks, select the first Deploy PartsUnlimited Website task and configure the inputs as shown below. 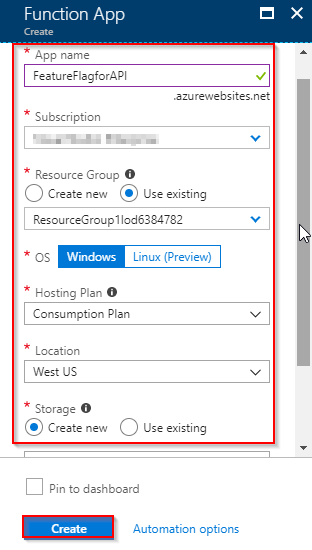 To authorize the Azure Subscription, first select the Azure subscription from the drop down and then the drop down within the Authorize button. 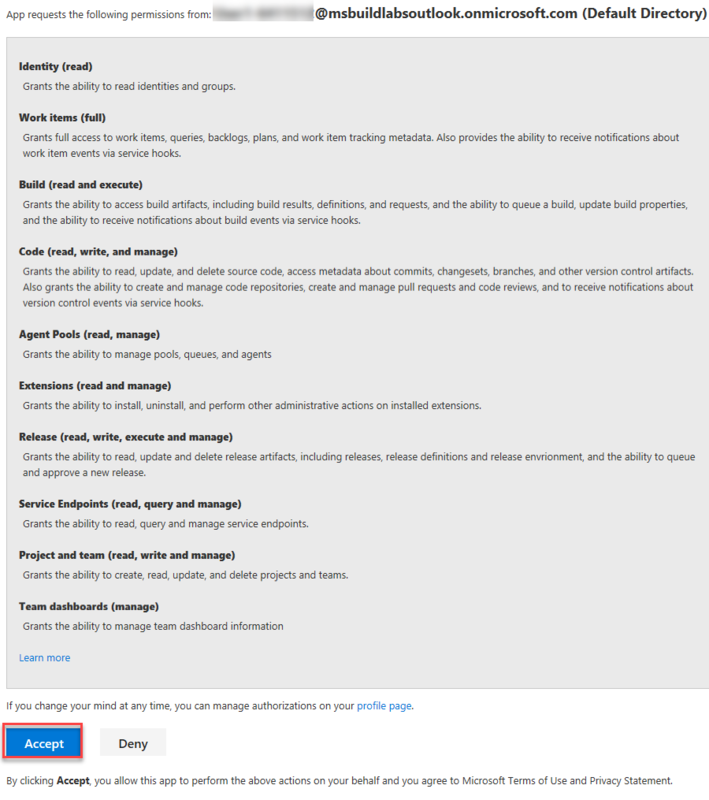 Click the drop down, choose Advanced Options and authorize Team Services to connect to the Azure subscription. For the PartsUnlimited APIs, select the second task and configure the inputs as shown below. 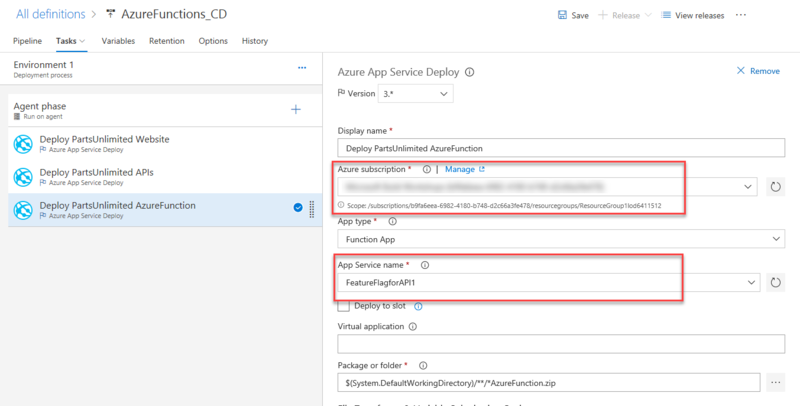 Select the third task to deploy PartsUnlimited Azure Function and configure the inputs as shown below. Click Save. In the Save dialog box, click OK. To test the release definition, click Release and then Create Release. On the Create new release dialog box, click Create. You will notice a new release being created. Select the link to navigate to the release. You can watch the live logs for the deployment as it happens. Wait for the release to be deployed to the Azure web app. Wait for the release to complete and succeed before proceeding to the next section. You will see the website as shown below. 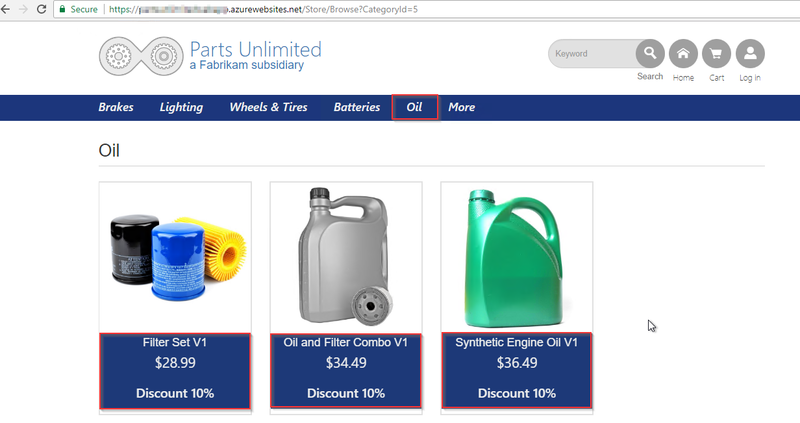 Navigate to Oil category, notice that products are showing discount as 10%. 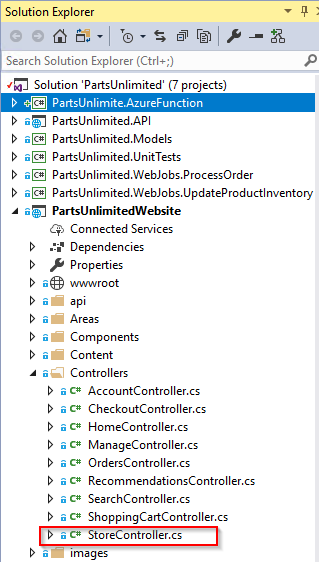 You have connected PartsUnlimited website to the Web API and used Azure function to retrieve data from either v1 or v2 of the API based on the user ID.